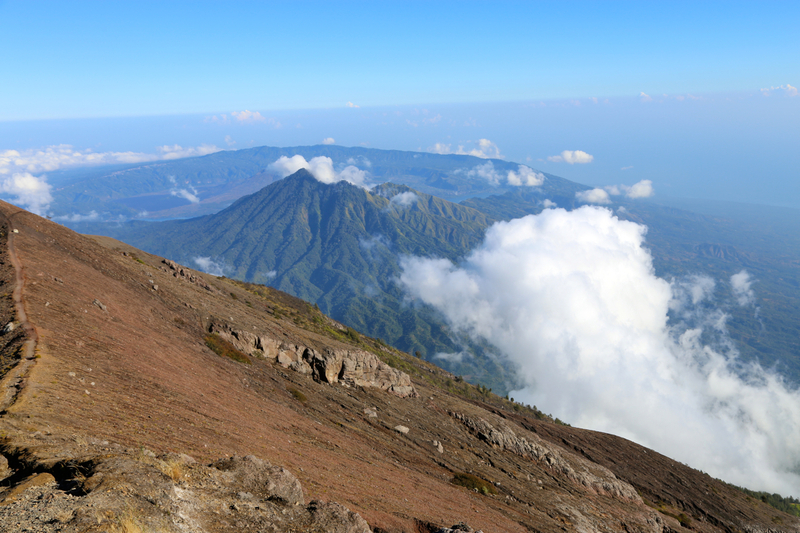 This mountain is the highest on the Indonesian island of Bali. 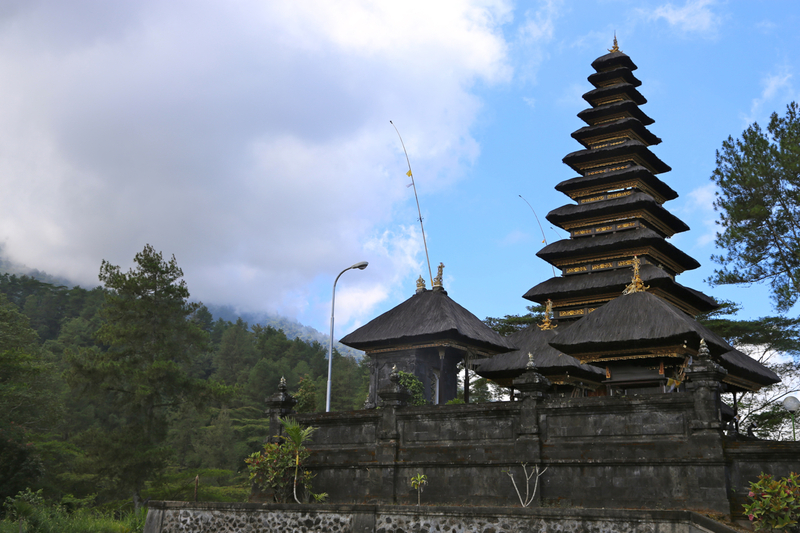 There are good flight connections via the largest city, Denpasar. 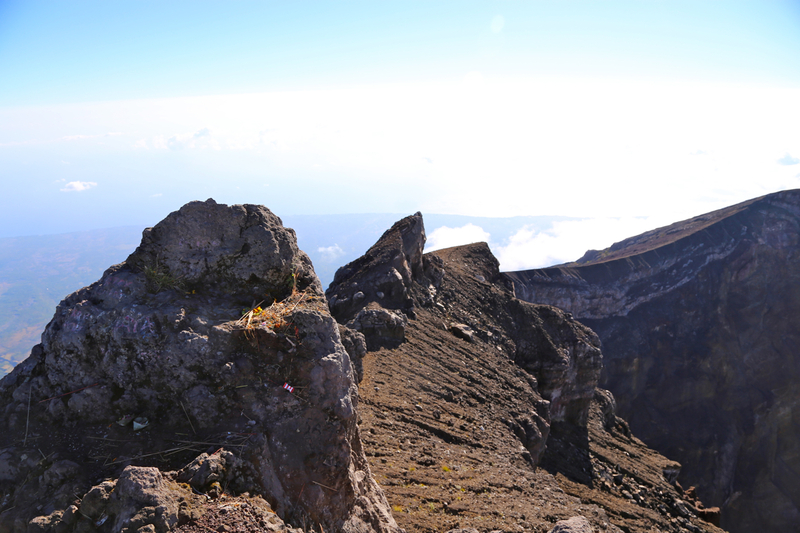 The mountain is north-east on the island, 2-3 hours by car from Denpasar. Note that there are two different trailheads, but only one trailhead that will take you to the summit of the mountain. 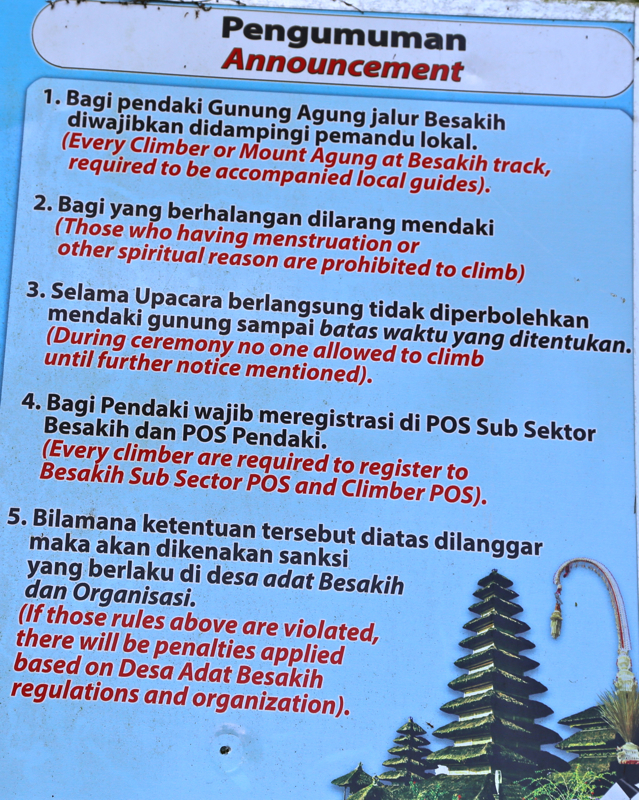 This trail starts at the location of Purah Besakih, the most important temple in Bali. One may drive from the large, main temple complex to a smaller, upper temple, it has a paved access road and a medium sized parking area. This location is S08.36372, E115.46126, elevation about 1160 meter. 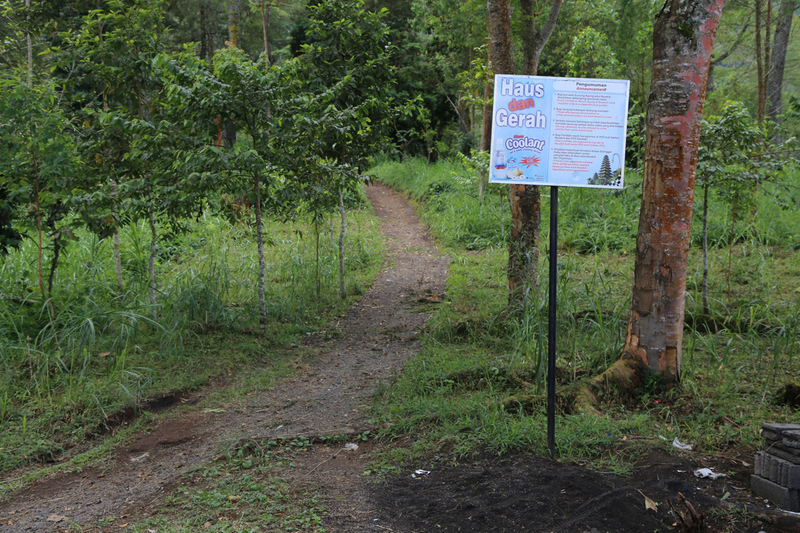 The trail heads into the forest next to a small registration post (that seems not in use) and a sign that informs hikers that they should use a local guide. There are no trail forks. 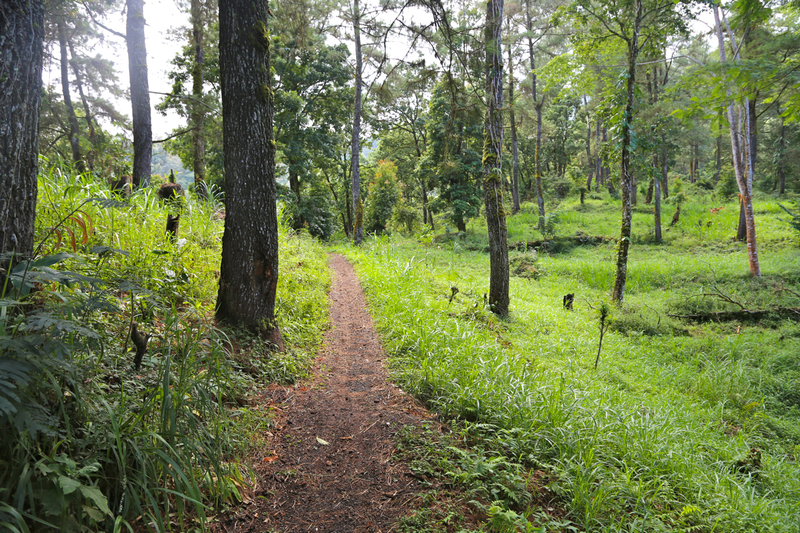 First, the trail runs through pretty open forest with large trees, quite a few horizontal sections before hitting the slope of Agung. 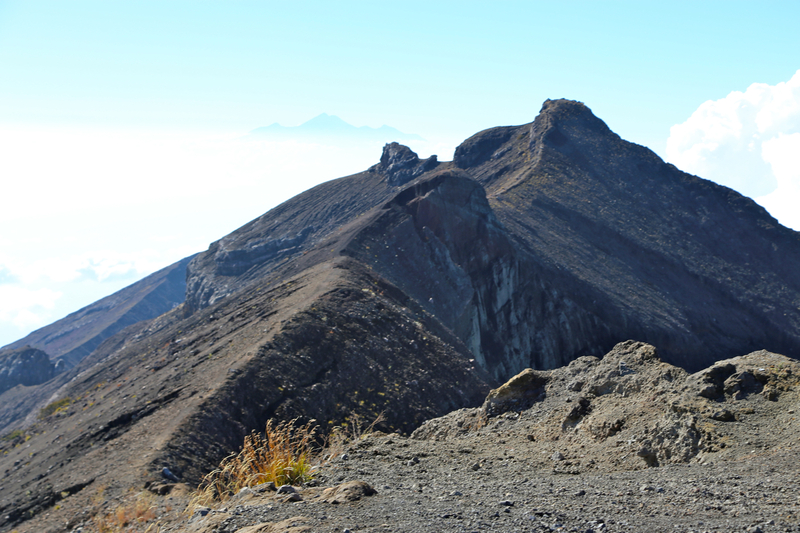 Next, the trail climbs along a long, pretty distinct ridge that has a few steeper steps. 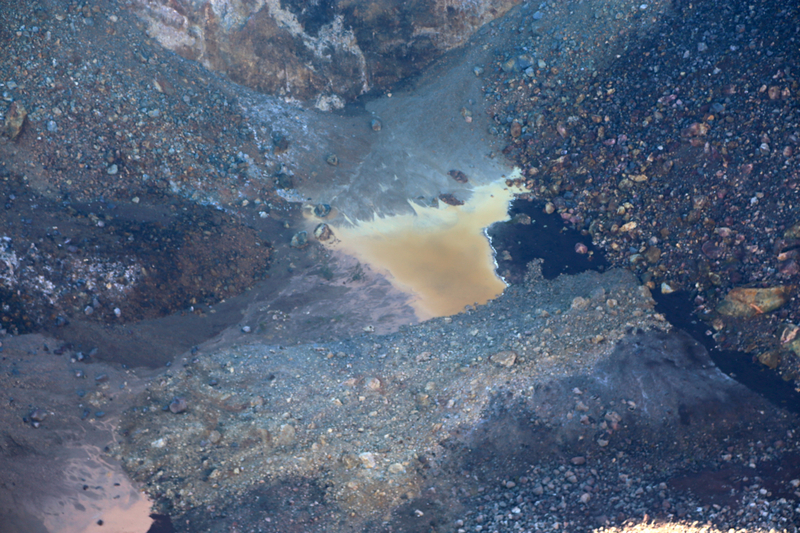 The trail may be a bit slippery, in particular after recent rain. There are a few short sections where roots provide steps in order to overcome otherwise steep parts. Higher up, the ridge has a rock-step. 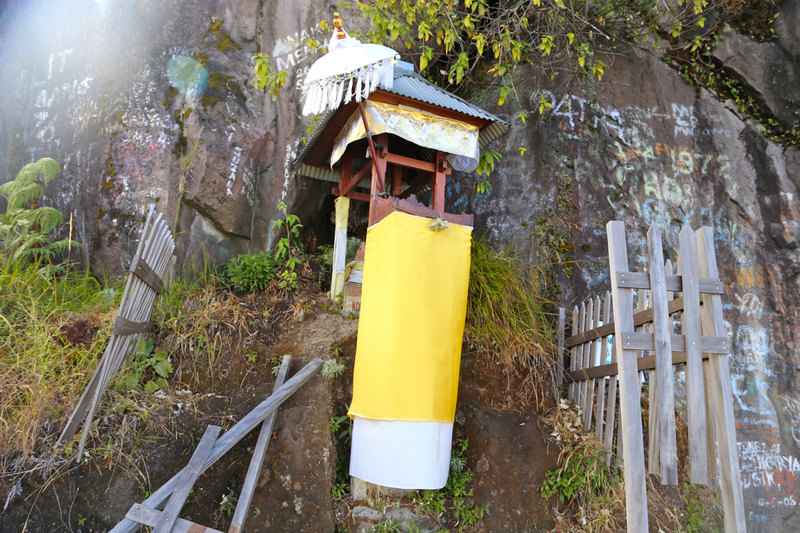 There is a "mini-temple" here and guides often do offering. The trail bypasses on the left as it becomes more rocky and regains the ridgeline above the step. 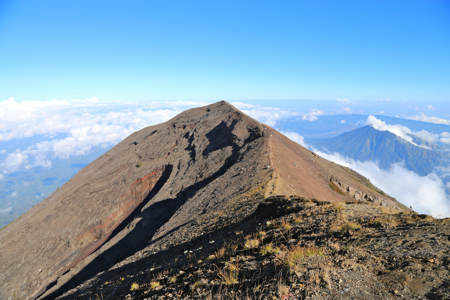 Finally, one ascends on a typical lava-ridge that gradually becomes less steep culminating at the west summit. From here, a nice ridge walk leads across east, first to a small subsidiary summit that may be bypassed on its left side, then onwards to the highest summit. 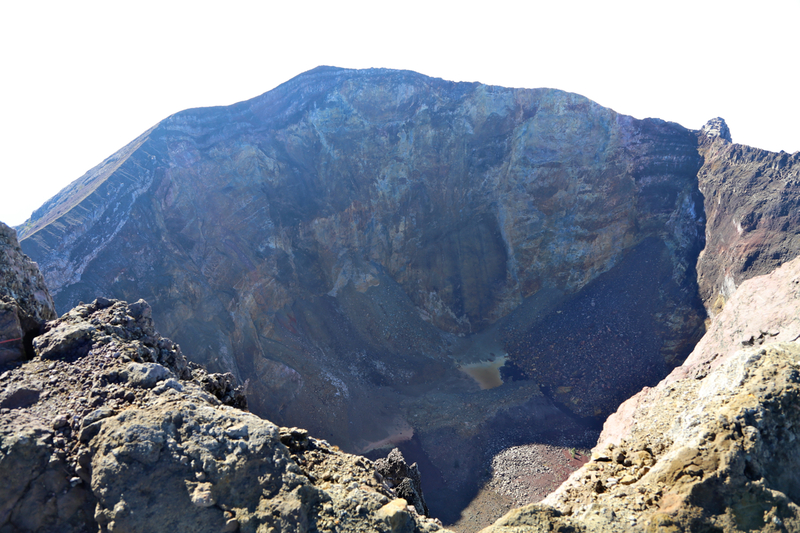 This summit turns out to form the highest point of the main Agung crater. I had planned for a start frommy hotel in Ubud at 0400. I woke up shortly after 0330, the rain was noisy on the roof of our small villa. Walking the short distance to the reception area did not reduce a slight concern. The rain was coming down by the buckets, tropical rain, just as violent as it only gets in this part of the world. My driver was already waiting and we set off to the trailhead somewhat more than one hour away. Fortunately, the rain stopped just before we parked the car. There, Wayan was waiting. Wayan would be my local guide, not that I really. needed a guide, but this activity is a nice supplement to the local economy. Wayan was 23 years old, he lived at a flower growing farm with his parents and guiding Agung was his only occupation besides helping on the farm. 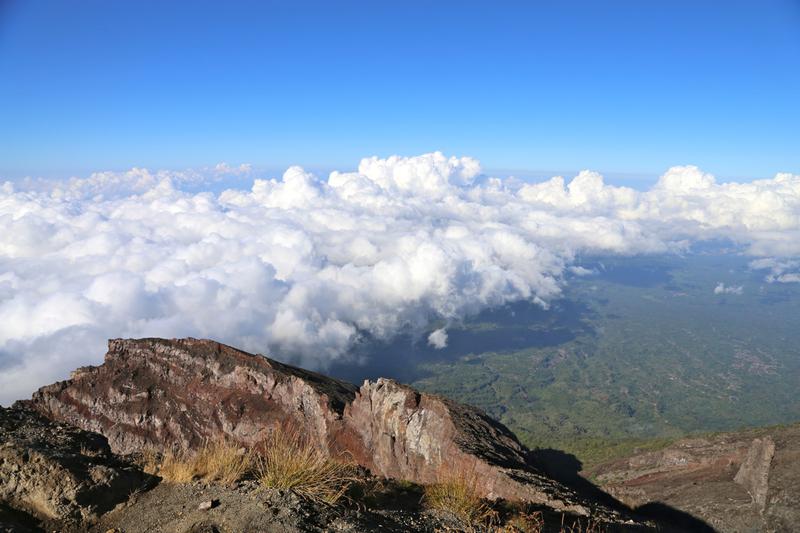 Wayan said he had climbed Agung more than 200 times already, that most climbs started around midnight and that many did not finish before 1800 in the evening. Taking a single person like me along was a welcome change. We set off at 0530, it was still dark, but I carried a strong head-lamp. A short break at 0630, showed a net gail of 692 vertical meter. 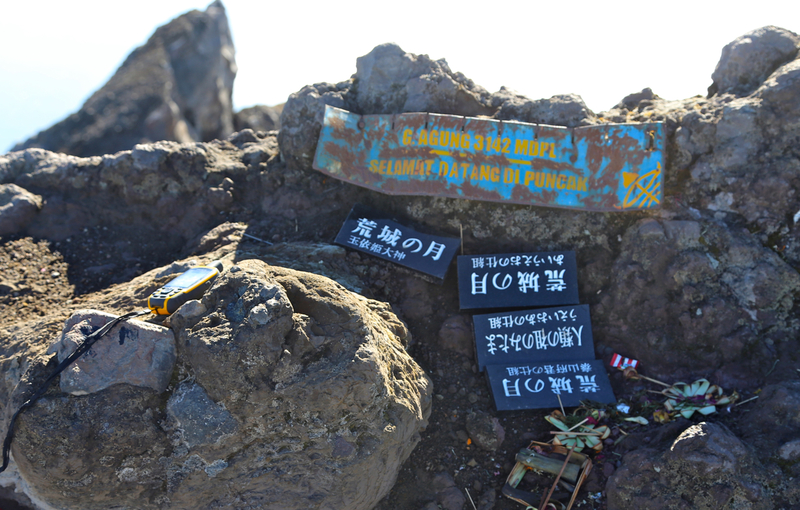 After 2 hours, we had gained another 650 meter and it seemed realistic to summit within 3 hours from leaving the car. 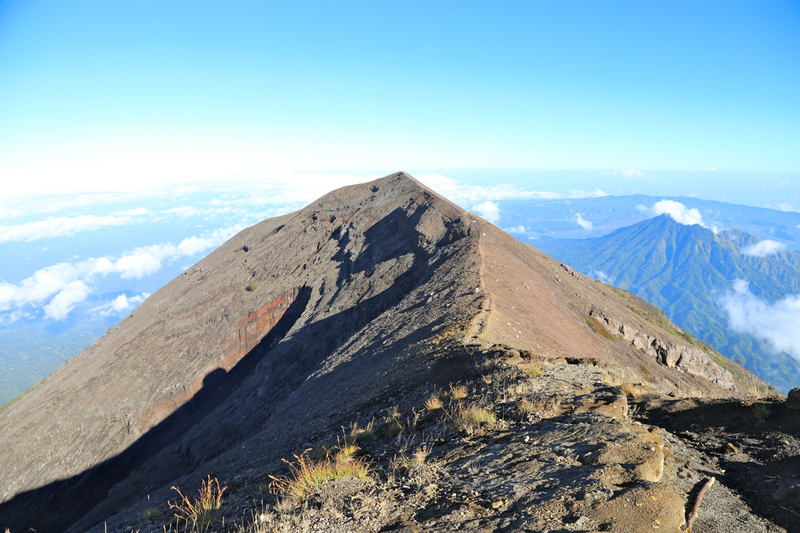 The final ridge to the west top was longer than it first seemed since the slope gradually decreased. It was also a bit hard to see the route ahead, since a strong sun now hit us directly in the face. Walking along the final ridge, (pic looking back) I increased to a light jog as I noted that this would get me to the summit precisely at 0830. Aside from a bit of wind, this was a nice location with good views. 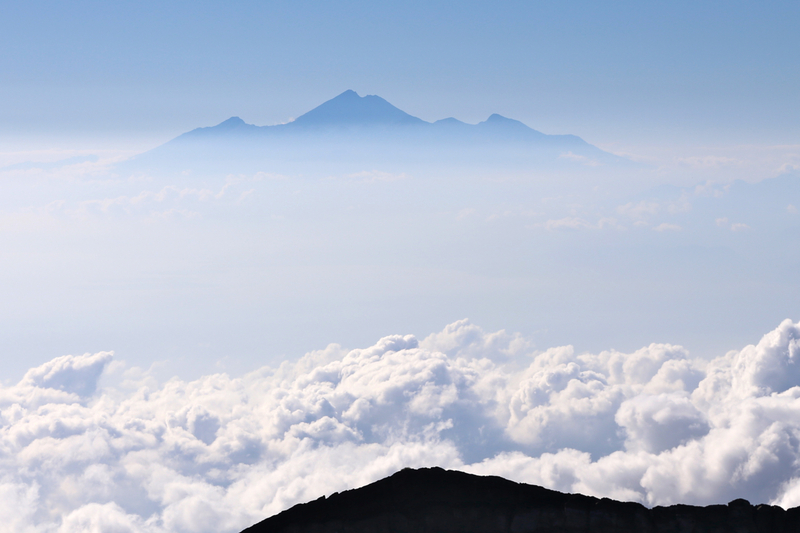 Rinjani, the Lombok HP, could be seen floating above the clouds. 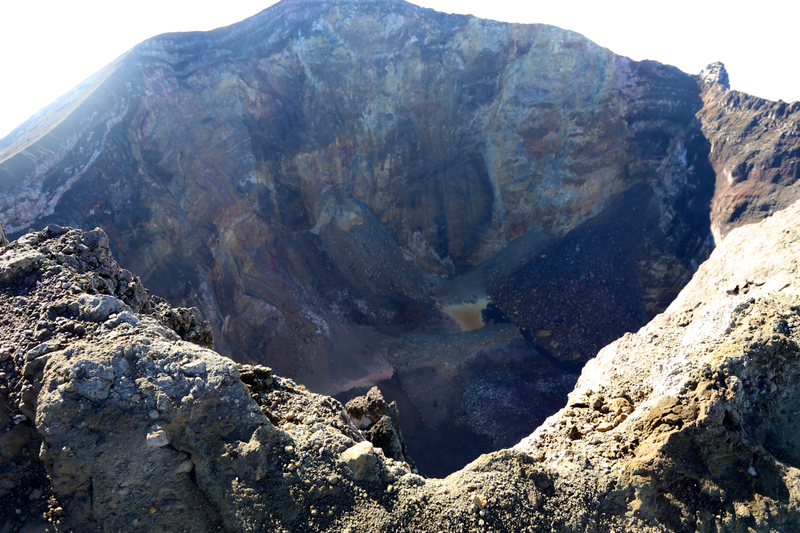 The crater of Agung was huge, deep and impressive. The view to the coast on the north side was pretty clear, while clouds covered most of the island. 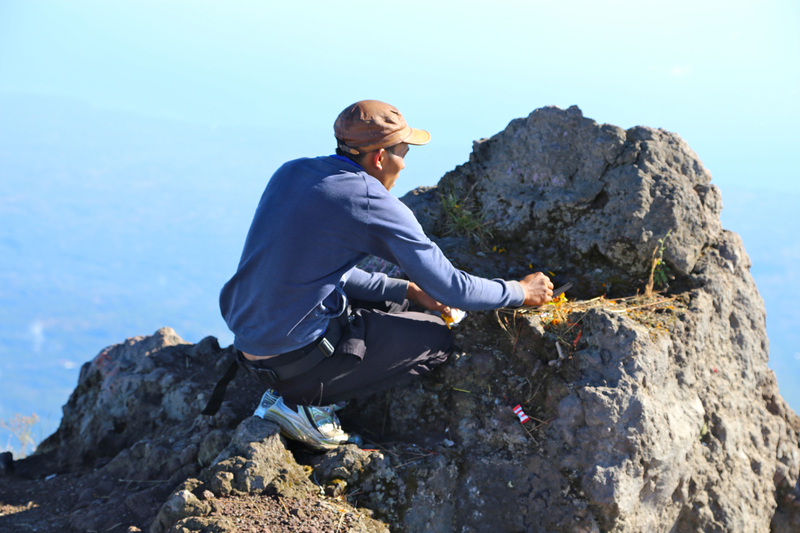 Wayan would do some offering, just as he had done already twice on our way uphill. 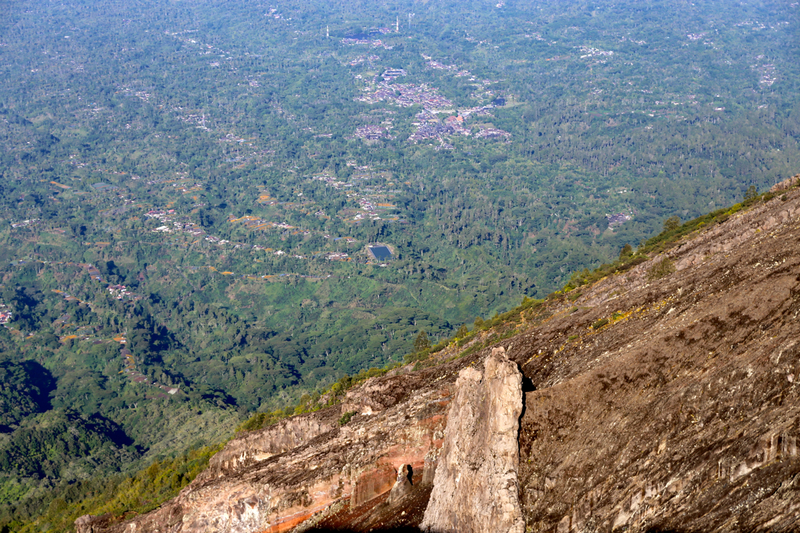 We could also see directly back down to the area near the Purah Besakih temple, this gave a good impression of the 2000 meter vertical difference. 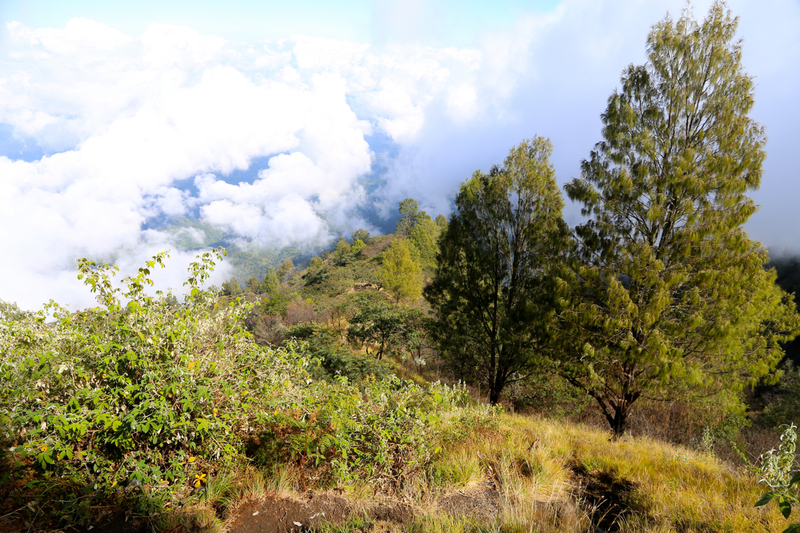 Wayan said that at least 3 other (larger) parties that had booked trekking with a start around midnight, had all been cancelled due to the heavy rain. Thus, we were the only party up here this morning. 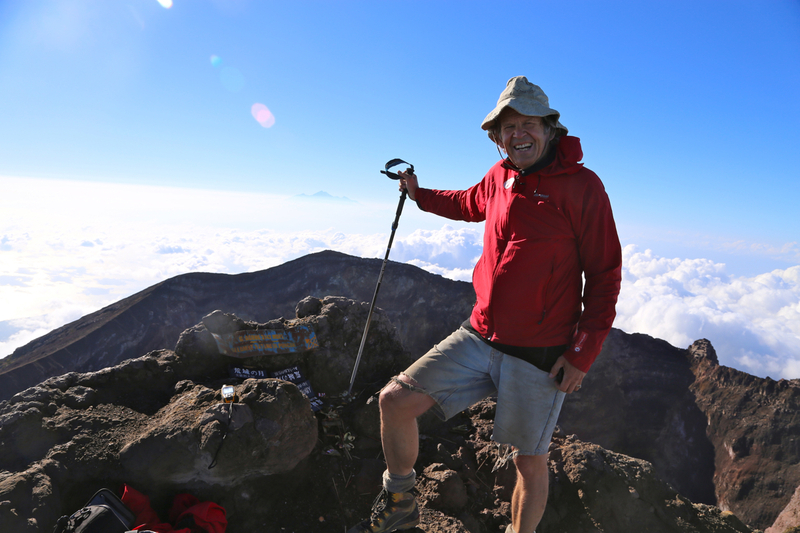 We stayed at the summit until 0900, then started our descent. It was easy going and interesting as we gradually dipped into the clouds from above, then descended through the clouds (fog!) with a final exit below the cloud cover and much improved visibility. We were back at the upper temple at 1145, the driver had set off, thinking that we would not return until the late afternoon. Wayan called him and he drove back up to retrieve me while Wayan set off home to his parents farm on his motorbike. 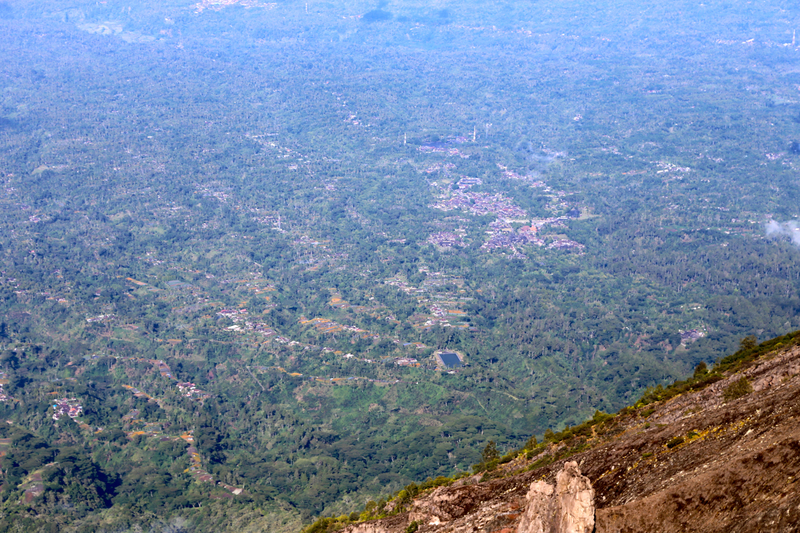 A very successful climb, with a relatively early return to Ubud where Heidi had relaxed in our excellent quarters.